Watch a pack of corgi puppies run, jump and play in a lush field of green, all shot in blissful slow-motion video. Your heart can't handle all this fluff. Slow-motion video makes cool things cooler, but it also makes cute things cuter. This slow-mo video of adorable corgi puppies running, playing and flopping about like bunny rabbits is probably the cutest thing you’ll see all day. Despite their unassuming size, the corgi breed is fairly extraordinary. Its history can be tracked back roughly 1,000 years to Welsh farmers, who used them to herd cattle and sheep. 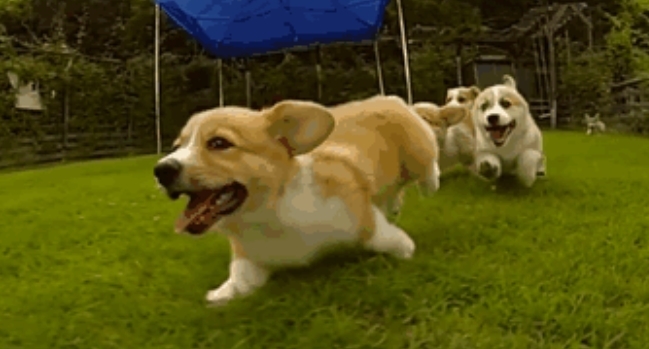 These cute Corgi butts were filmed in slow-mo in Japan. Responses to "Let corgis running in slow-motion fluff up your heart (Video)"
One of the most adorable dogs ever. Love them!